Mark is a native of Richmond, Virginia, currently living in Midlothian and is a Senior Business Analyst for the Virginia Department of Taxation. He is married and the fatherof three kids. He has worked as a volunteer historical interpreter at Jamestown Settlement, the Yorktown Victory Center, and the Watermen’s Museum in Yorktown. I have also volunteered at Thomas Jefferson’s Monticello, Patrick Henry’s Scotchtown, Hanover Tavern, and Meadow Farms Museum. For the past eight years he has volunteered for Richmond National Battlefield Park, providing support for ranger-led battlefield tours, special events, and some historical interpretation. 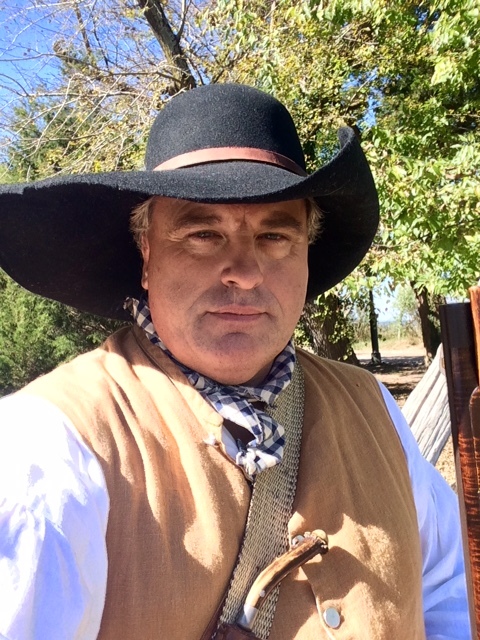 In addition, Mark has had some acting roles, performing dramatic scenes for Scotchtown, Meadow Farms Museum, Rural Plains, and Richmond National Battlefield Park. In 2015, I performed a program at Old Hanover Courthouse as part of The Parson’s Cause Foundation. He is also a member of the Richmond Chapter of the Revolutionary War Round Table and friends of Hanover Tavern.